I’ve been so excited to share this post with you guys! 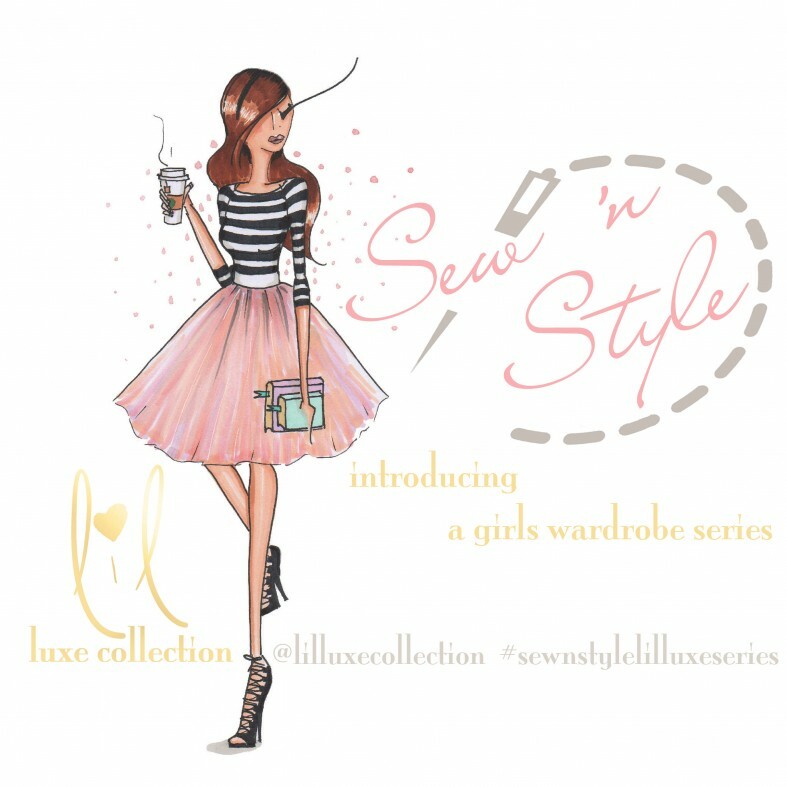 Lil Luxe Collection created a series called Sew ‘N Style where you take the time to consult with your child and make a mini collection that they would love to wear. You can find out more details on the series by clicking over here. It’s well known that this four year old LOVES purple, but other than that I wasn’t sure what direction our collaborative collection would go. I wanted to use all fabrics I had in my stash, so the first thing we did was look through some fabrics to see which was her favorite. 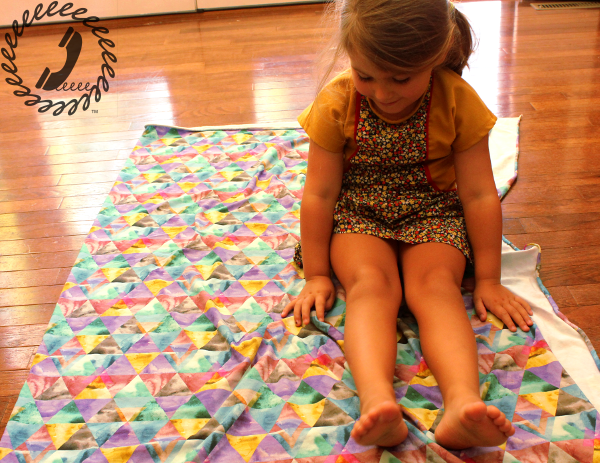 It all started with this triangle/pyramid knit fabric from kitschy coo. 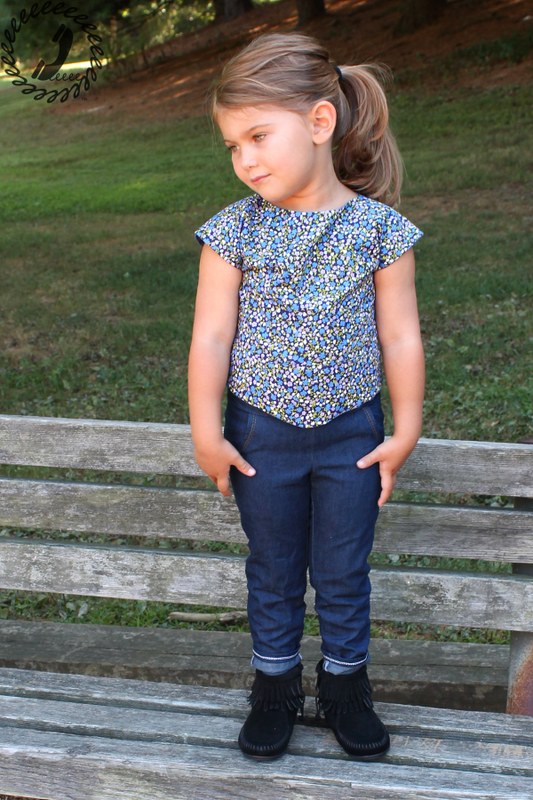 I ordered it earlier this summer and planned some fun leggings with it, but in all this Maryland heat I hadn’t been able to bring myself to start her leggings so they still hadn’t been cut. 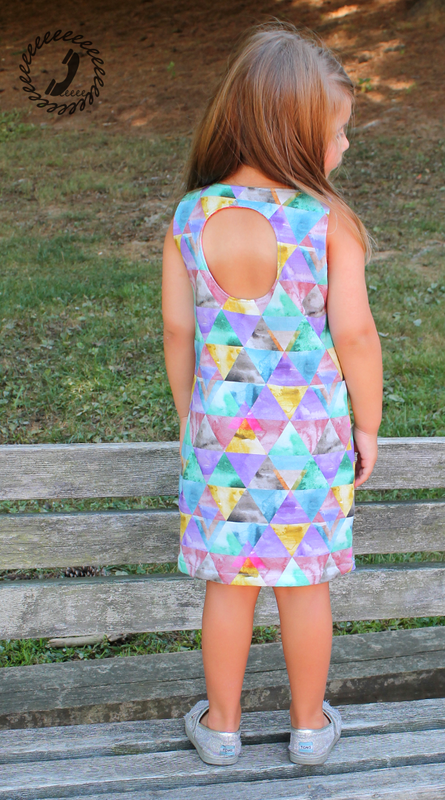 She loved the purples in it (of course), but she said she liked how the watercolor triangles had “clouds” inside them. It’s true that the cool watercolor effect does sort of look cloud-like, but I wouldn’t have thought it if she didn’t mention it. From this fabric came the color story of the collection – more pastel than I would normally lean – and led us on a search for more shapes in my fabric stash. She was particularly insistent on triangles. Ultimately these were the fabrics we chose. Actually, I did most of the pairings late one night, but together we had chosen the coral open weave sweater knit (on top of the triangles in the pic above), the navy with gold on the far left (she had a sunsuit made from that fabric earlier in the summer and she remembered the little gold “triangles”), the gold chevrons (of course), and the solid purple fabric which perfectly matched the purple in the inspiration knit. The rest of the fabrics I pulled (and got approval from the four-year-old) once I had chosen the patterns for the collection. With just six pieces of clothing we have at least 12 different looks which is very exciting. Are you ready for some of the details? I’ll link to any fabric or patterns that are linkable at the very end so we can get through this picture heavy post a little quicker! We’ll start with this dress that started it all. 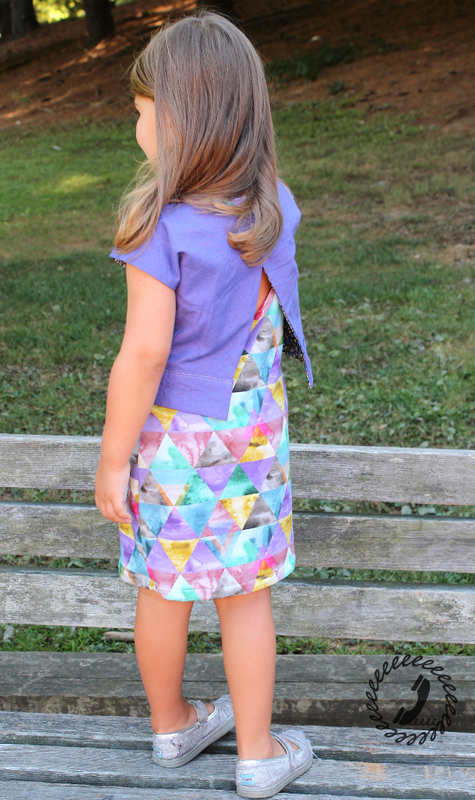 We love the Anywhere Dress by Go To Patterns and I usually make at least one a season for Bean. I mashed the Charming Tee with the back of the Anywhere dress as I love that circular cutout. I thought the circle would play nicely with the rest of the sharper angles in the collection. I made the Anywhere/Charming dress sleeveless and reversible which is one of my favorite things to do to extend Bean’s wardrobe. It gives her options even when I choose something for her to wear. I say something like “today you’ll wear this dress, but which side do you want to be on the outside?” It empowers her with a choice, but still narrows things down for weather/activity appropriate clothing. The coral fabric for the reverse of the dress is really hard to photograph. It’s an open weave, super stretchy, and a little shiny, but I have no idea what actual substrate it is. 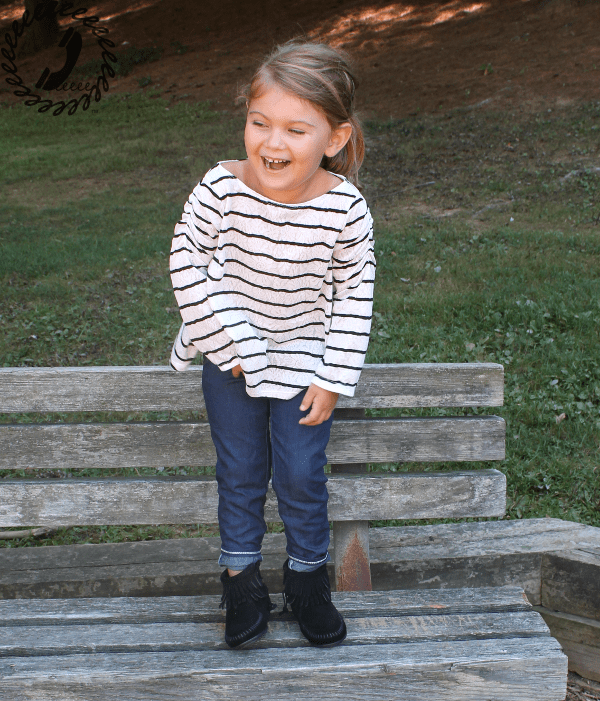 Again, I pictured tights or leggings when I originally bought the fabric, but those chevron cutout shapes and the color meant it was perfect for this collection and Bean was immediately drawn to it. The triangle fabric is white on the reverse side, so it lends a backdrop to the open weave in this coral knit. Speaking of extending the use of a piece of clothing, the Reversible Crop Top is one of our favorites around here. Last year I made a similar outfit with one side of the crop top in Christmasy fabrics and the other with “normal” so her Christmas outfit could be worn all winter! The shape of the Reversible crop top is very angular which gives it its stand out style. The shape of the bottom front fits in just right with the collection. Also, the front isn’t super short which is nice in a crop top since I can still feel comfortable sending her to school wearing it without revealing her belly. The back has that great V opening which I love. It allows just a hint of the reverse fabric to reveal itself which is fun. The purple fabric is an artisan cotton from Imagine Gnats which has so much vibrance in person. 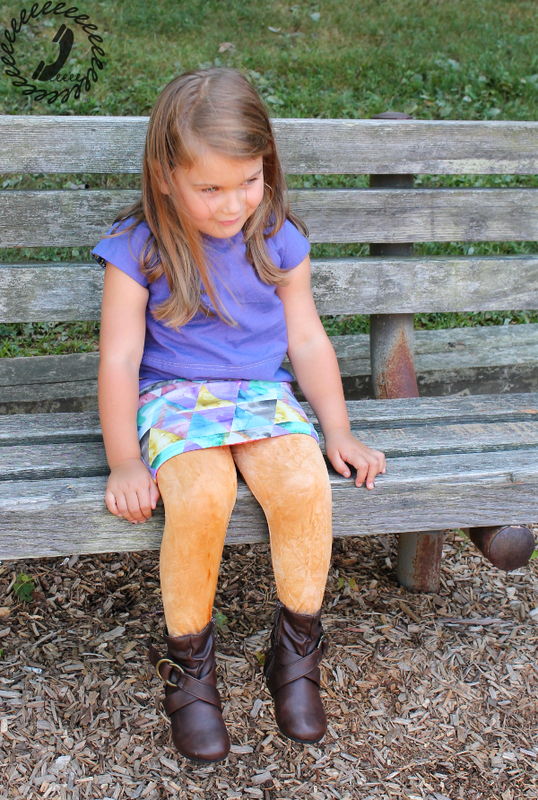 Add a pair of gold tights to the outfit and it’s perfect for those cooler mornings we’ll be experiencing soon! The tights are a new pattern releasing on Monday from The Wolf and the Tree which you won’t want to miss. 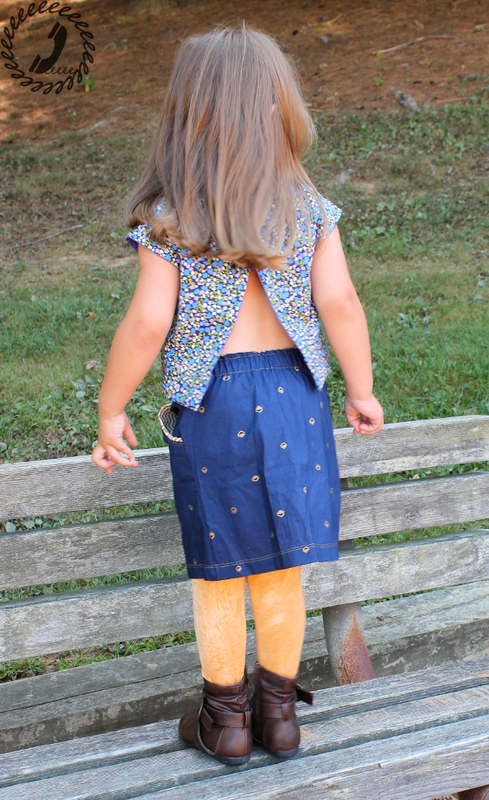 The tights can also be worn with the navy and gold Paneled Sunsuit Skirt. The fabric is from cotton + steel and has those mysterious gold shapes that Bean is convinced are triangles. 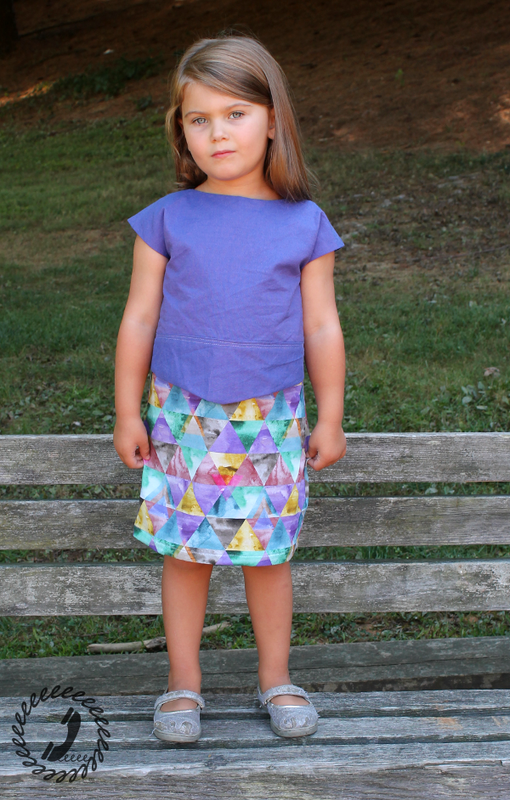 You can see in this pic that the gold chevron was used for the faux piping pockets on the skirt. One of my favorite looks from this collection is the simplicity of the Reversible Crop Top (worn either side out) with a pair of the Slim Trousers. I made a size 5 trousers for Bean and though the length is perfect, she is really into the size 6X already so I’ll have to size up. These are snug through the waist and hip, but I still love them. Luckily they are super quick to make if you leave off the cool zipper options so I can whip up another pair in a bigger size. I used the elastic waist option, but only added the elastic to the back so the front would stay flat. 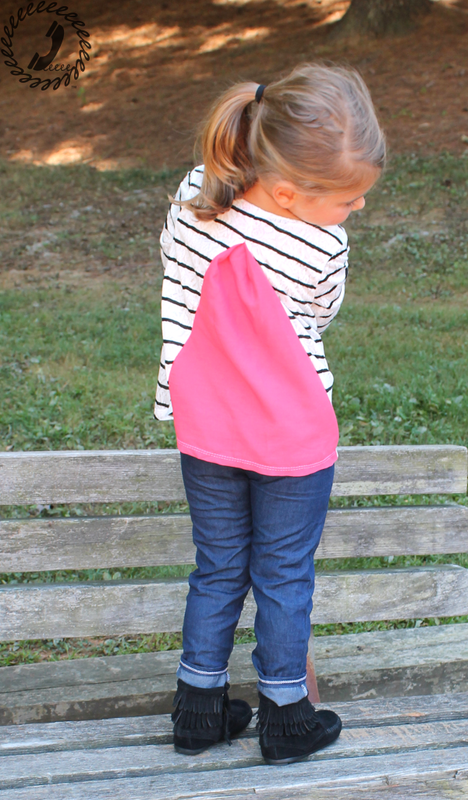 That’s my favorite way to make pants for my girl and the Slim Trousers work great for that. 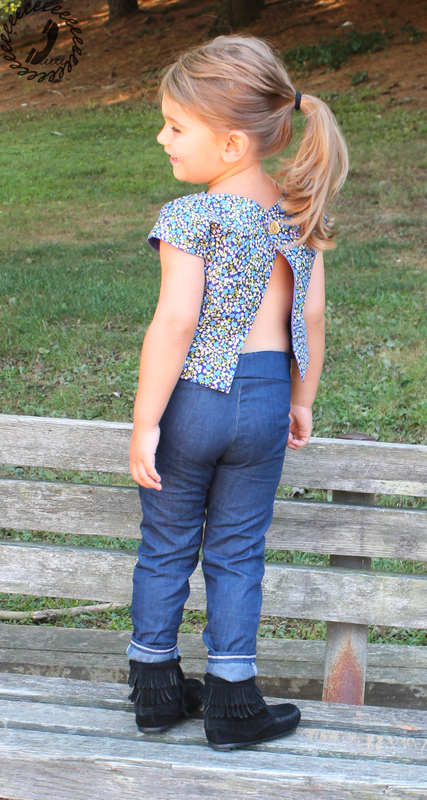 In the pic above you can see the gold button I used for both sides of the reversible crop top. The trouser also goes well with this Rouche and Division Top. The Rouche and Division has a triangular flare that is so fun and super flattering. It’s probably my favorite top pattern. It sews up really quick, but still has some great details. I used the rouching on the sleeves, though it’s a little hard to tell with this striped stretch lace. The stretch lace is a bit sheer so for the rest of the season Bean will wear it with a tank top underneath (for added warmth/layering), but for now it’s not so sheer that it’s inappropriate for a little girl to wear. I love this pic of Bean laughing. It’s such a great belly laugh, but it also shows the wide boatneck shape of the top which I adore. So I knew I had to have a rouche and division top since it was a must in Bean’s fall wardrobe anyway (we seriously can’t say enough good things about the shape of this top). The stripes (like the circular cutout of the dress) were thrown into the collection as a contrast to the angles in the rest of the collection. Also those black and white stripes look SO GOOD with this delicate looking coral rayon challis from imagine gnats. As soon as we settled on the reverse of the dress being the coral open weave knit, I knew I wanted to use this same color rayon challis somewhere in the collection. When I opened the pattern to double check what size Bean should be wearing now, I was reminded that this top can be made out of knit OR woven fabrics. That triangular pleated section in the back of the top would be the perfect spot for the woven challis. And tying everything back together, this Rouche and Division top works as a layering piece over the coral side of the Anywhere/Charming dress. This look might be my favorite right now. Don’t ask me tomorrow though…. I keep changing my mind for which is the best, hehe. 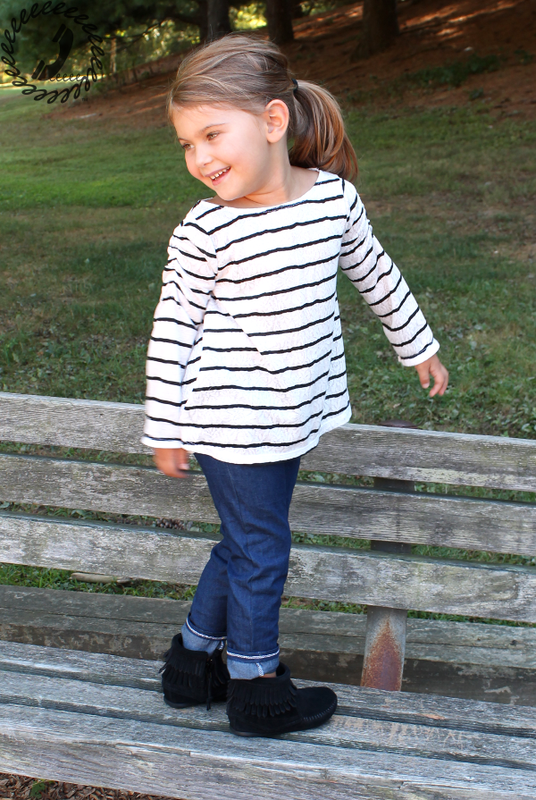 So as you can see with just 6 pieces, we have so many options for the coming cooler weather. 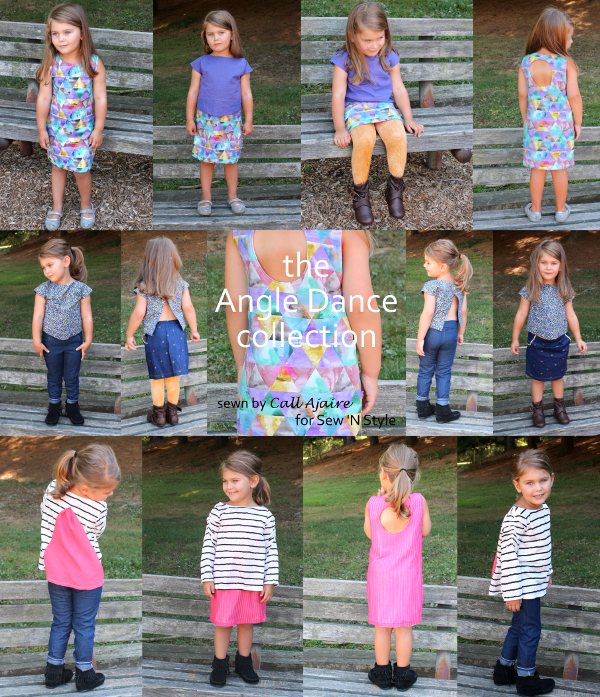 And believe it or not, I sewed this entire collection in just four hours. There was a mix-up with the dates on my calendar and I found out at the last minute that though I was prepared in terms of a plan for fabrics and patterns (Bean and I had discussed it all way in advance in case I decided I needed to order fabric or accesories), my timing for the collection to be finished was off by days. So I hunkered down and sewed it all at once and I have to say that even though I’ve sewn all these patterns before which really helps in terms of time, all of these patterns are super quick sews. That’s a lot of style for just a little time which is really exciting. 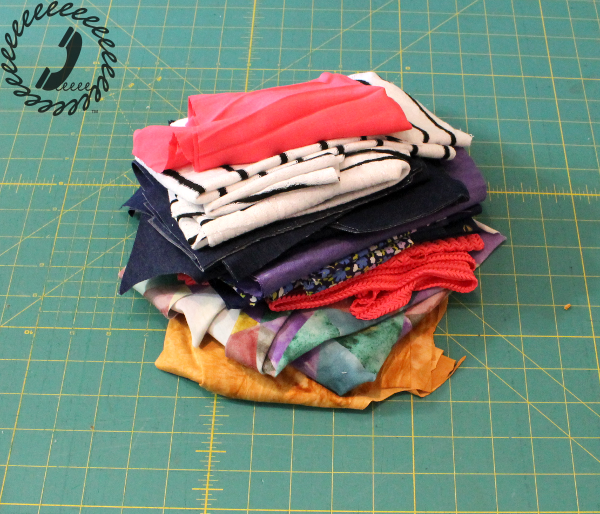 I mean, not that I ever want to sew an entire collection in a few hours again, hehe. And finally here are the details of the collection. Some of the links below contain an affiliate code which means that any resulting purchase may result in a percentage of the sale going to Call Ajaire, with no extra cost for you. Any affiliate links will have an * after them. If you’re still reading this post, then you’re probably wondering where the Angle Dance name came from, right? Well there was this song from Square One called Angle Dance which my younger sister and I loved when we were kids. It (like pretty much the entire Square One show) is this geeky song which explains what angles are in a silly way. Now with all those triangles throughout the collection I couldn’t help but sing this ridiculous song in my head THE ENTIRE time I was sewing. When it came time to name the collection it was still in my head (and making me laugh) so the name sort of stuck. Also, if you’ve never heard this song or seen this video before…. you’re welcome.